I was fortunate to have interviewed my Grandfather for a Hawaiian History assignment at the University of Hawaii when I was a Junior in 1973. He was born in 1889, that would make him 84 years old at the time. In looking back, it was the most rewarding thing I did for 3 college credits in my 4 years there. I was a History Major, not really knowing what to do with it, but I I knew I wasn't going into Business. I was all of 21 years old and had no interest in Business as it was taught at UH. The business building's lecture auditorium was dimly lit, the sound was soft and the speakers were monotone. It was a great place to take a nap. Little did I know that at age 66, 45 years of my life would be spent the helping to run the business that my grandfather started. Wong Inn [Surname is first] was born in Honolulu, son of a Sugar Cane Contract Laborer, and sailed with his father back to his ancestoral village in China at age 4. It was 1893, the year the Hawaiian Monarchy was overthrown and ironically, it was the owners of the Sugar Plantations that spearheaded the takeover. I can only speculate if the return to China was related to this historic event in Hawaii. 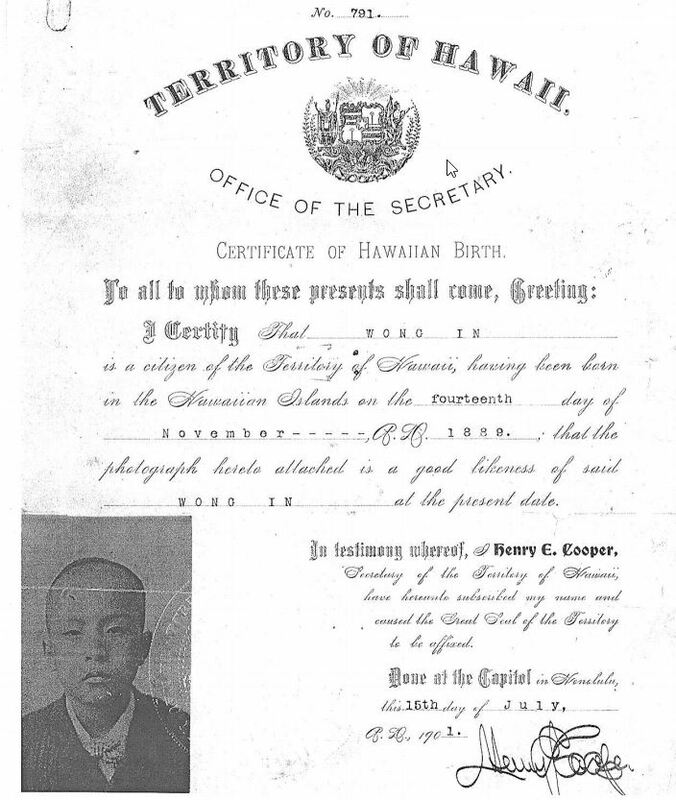 The young Wong then returned to Hawaiian soil in 1901 as a 12 year old boy. [See pic] Out on the open seas in a wooden ship for a month must have been grueling, especially for a child. I remember him saying, “I could hear the screams when someone was so sick that they jumped overboard” without any drama in his voice. Having survived the journey, waiting for him in Maui was an uncle from whom he would eventually run away from, to Honolulu. The bloodless takeover by the US Big Business backed by the Military just 8 years earlier gave them total dominance of the economy of the Islands. A small opening was left to those who could save enough money to eventually have their own assets, most notably their own businesses, and ultimately their own land. This was an opportunity that my “Goong Goong” and many other Chinese immigrants in Hawaii would make the most of.